Honesty and simplicity are at the heart of our spirits. We believe you have the right to know what you put in your body, and what we put in our alcohol. Fresh farm raised grains and potatoes form the base for our whiskies. Hardwoods harvested from our forests lend their color, character and aromas, and fruit from our orchards and maple syrup fired in springtime temper our spirits with their sweetness. That's it. That's our secret. Grow the best ingredients, and craft them into the best spirits. The little village of Hookerville, down the road from our distillery in Cabot, was once a hotbed of local hops production in the 19th century. Growing alone by the edge of a field in the village, we found a surviving hop plant, an heirloom of our agricultural past. Transplanted to our farm, it is again producing bountiful crops of aromatic hop cones. We've infused our organically grown oat and flint corn spirit with our own hops and finished the spirit on toasted American Beech wood staves. Bottled at 80 proof. Inspired by the French Liquor Pommeau, we decided to make our own blend of fresh apple cider and spirits. Hand-pressed on a timber frame and oat straw cider press we built on the farm, our sweet cider is sourced from our own organically grown apples. Blended with pure oat whiskey double-distilled from our own farm-raised oats, our Spirited Cider is sweet and smooth at 40 proof. We dedicate this spirit to Mark Hall, a Civil War veteran that ran our farm from 1865 until 1878. 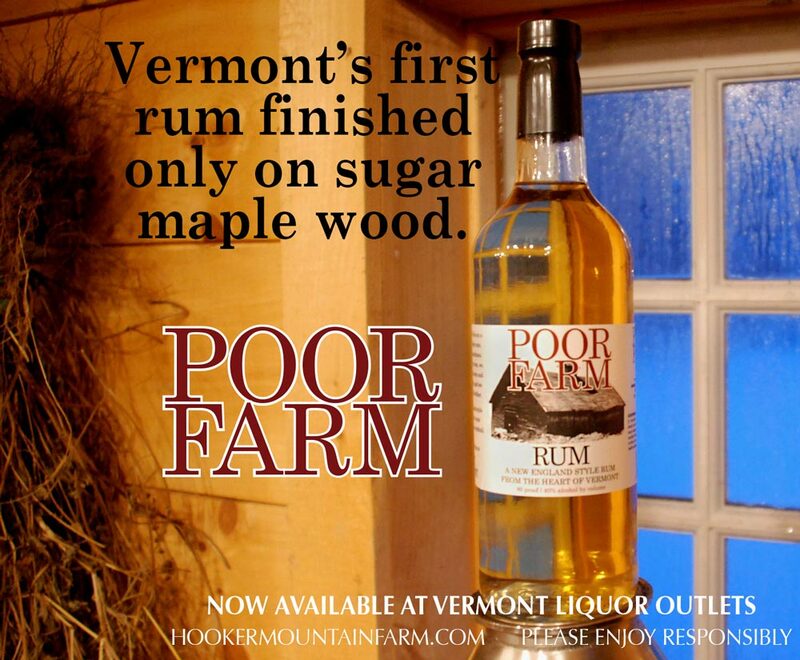 The Sugar Maple is by far the most iconic of Vermont’s flora. Our tribute to this mighty tree begins by double distilling our farm-raised oats, corn, rye and barley in our traditional pot still. After infusing with toasted sugar maple wood, we lightly sweeten it with a touch of our wood-fired maple syrup. 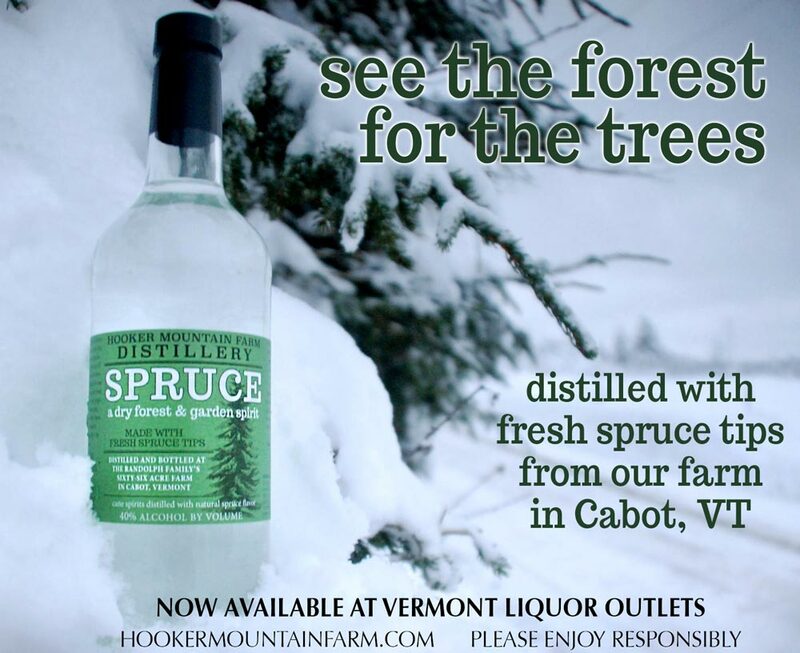 In what is most certainly a first in the world of distilling, we blend this fine spirit to drinking strength using fresh, pure maple sap from our sugarbush. Bottled at farmer strength, 90 proof, we're proud to call it our flagship. Long ago, the pioneers of Vermont packed stills full of fresh yellow birch to harvest the wintergreen scented oil found in its bark. We’ve resurrected this long forgotten art to infuse our grain spirits with the beautiful fragrance of birch. Steeped on toasted yellow birch wood, it’s sweetened with a touch of our pure maple syrup and blended with birch essence and maple sap to 90 proof. Best served straight or on ice, this truly unique spirit has quickly become one of our customers' favorites. For 15 years starting in 1777, Vermont was an independent nation. Clearly, we never lost that spirit of freedom and self-determination. We've taken our mixed grain farm whiskey and finished it on toasted black cherry wood before blending it with pure maple sap and bottling it up at 90 proof. Hey, who’s to say our history won’t repeat itself. And if it does, at least we’ll still have plenty of good whiskey to drink while we find our own way. So raise a glass with us to celebrate our little state’s free spirit. Everyone’s fire needs to be stoked now and again. We’ve taken our double-distilled spirits of farm-raised potatoes and mixed grains and infused them with toasted white ash wood, perhaps the best firewood tree there is. Throw in some roasted habanero peppers and our own wood-fired maple syrup, well that should be enough heat to warm up any drafty farmhouse. Bottled at farmer strength, 90 proof. We practice traditional (pre-prohibition) distilling practices whenever possible. Why? Because those people put flavor over profit and so do we. All our grains and potatoes are open-top fermented using a sour mash technique that perpetuates our own distillery's strain of yeast microbiota. We ferment on the grain with the hull on. We Twice-Distill every batch of our alcohol in a traditional direct fired pot still. We only use native hardwoods for coloring and flavoring and toast them in a wood-fired oven. Oh, and did I mention we grow the grain? Is any of this efficient? No. Does it make a better whiskey? Oh, yes. "I would have bottled my blood, sweat and tears. That certainly would have been easier. It's just that whiskey, bacon and maple syrup taste a lot better."